Can you capture the essence of an entire year in a short video? It was tough, but we did it. 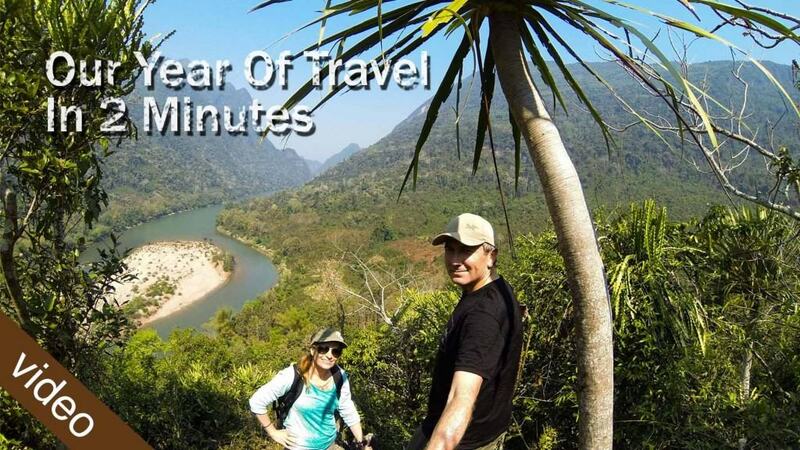 This is our year of travel in 2 minutes. It started in January 2015, we left our careers, sold our home to embark on a new lifestyle full of travel. To mark the year, we created a short video looking back on our first year of full –time travel in just 2 minutes. Our video includes scenes from our year of travel to: Thailand, Laos, Myanmar, Indonesia, Australia, Portland, Oregon, U.S.A. Nicaragua, Costa Rica, Panama, and Colombia. 2015 was a year of change for us. It was a complete transformation in the way we live our lives. We no longer owned a home, left our established careers after 20 years, and crammed our few remaining possessions into two backpacks each. Our word of the year was change, a word that symbolized our new approach to living. We learned how to live more simply, more economically, and develop many new skills to inspire us with new careers. We learned about our own limits, our fears and most importantly we learned more about each other than the last 9 years of marriage. Thanks for watching! Have you traveled for an extended period of time? We’d like to hear your story.